Yesterday. 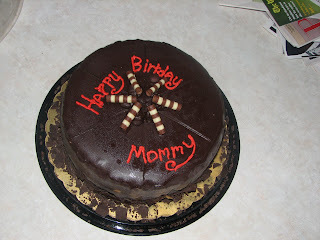 The Cold Stone Creamery Chocolate Chocolate Chocolate ice cream cake. Amelia said, “This is the yummiest cake I ever eated.” he he. It is almost too much chocolate. Almost, I said. 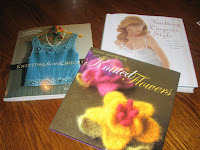 Today, I got several knitting books I ordered on Amazon from a gift certificate from BIL Mark. Must have knitting books, as many as possible. Even more when someone else is paying for them. I also got a package from my Knitter’s Tea Swap 3 partner yesterday. 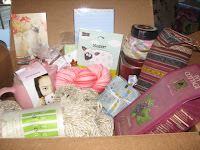 Lots of great stuff, but my faves are the really pretty sock yarn and a cute pink teapot for one. It has gone to the office. Oh, and more chocolate. Aww! I won the drawing on the Fitted Knits KAL! The prize came today, it is a $40 gift certificate for Webs. Shopping!!!!! Whoo hoo!! Happy Belated Birthday. Your cake and goodies look great! Hope it was a fun day. And CONGRATULATIONS on the drawing!